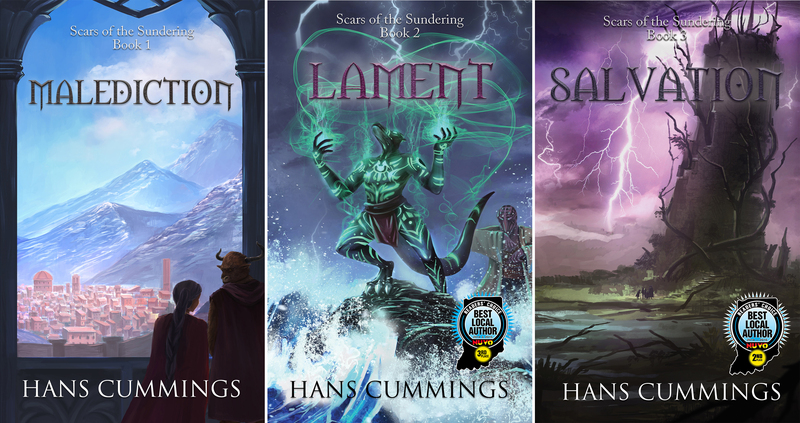 Scars of the Sundering, books 1 and 2 (Malediction and Lament) are only $0.99 for Kindle. Book 3 (Salvation) is FREE! Scars of the Sundering is an epic fantasy trilogy telling the tale of the minotaur Pancras and his friends, the drak twins Kale and Delilah, as they venture out into a world that, until recently, considered their kind to be mere monsters. They must deal with more than just the prejudices of the neighboring humans as they stumble into political plots and ancient evils unveil themselves. 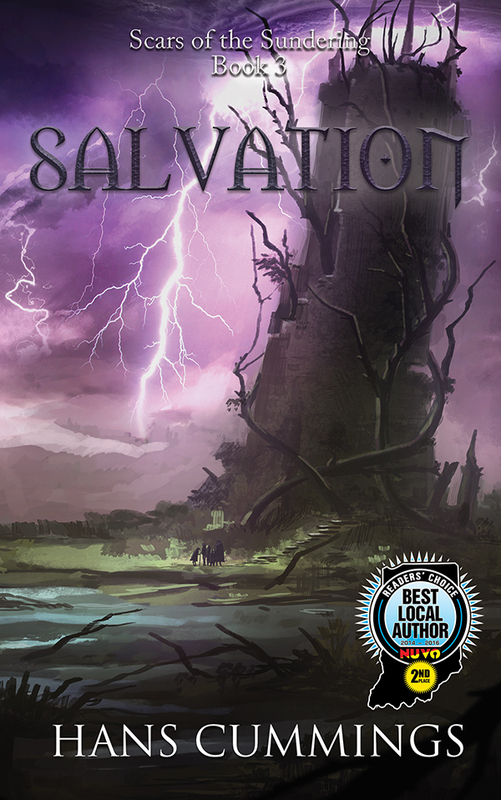 Salvation coming to Kindle on July 14th! Your Salvation arrives on July 14th. Scars of the Sundering, book 3 available on Kindle. Life has a way of sweeping you to unexpected destinations, as Pancras discovers as he continues his investigation into the Lich Queen’s return. Enlisting the aid of Justicars, the stern knights in the service of the Divine Tribunal, he tracks a growing army to Badon Hill, the site of the Lich Queen’s last battle. Returning to Muncifer and burdened with the truths discovered in the Valley of the Iron Giants, Delilah and Kale must bring the megalomaniacal archmage Vilkan Icebreaker to justice. Delilah takes it upon herself to keep the vast arcane secrets she carries safe from the archmage while Kale struggles to balance his desire for adventure with his responsibilities to his mate. As their worlds collide and their enemies advance, the twins and Pancras have their mettle and faith tested as the fate of their world hangs in the balance. In addition to Gen Con, I will be at TeenCon 2017 at the New Castle-Henry County Public Library this Saturday, July 15 from 10am – 3pm. As Lament goes into the final round of proofreading, I now have the finished cover art! Lily Yang once again lent her talents to my cover (you’ve seen her work before on Malediction), and did a fantastic job. In my last character Sneak Peak, we looked at The Golden Slayer. Also making her debut in Scars of the Sundering: Lament, is the fiendling Qaliah. 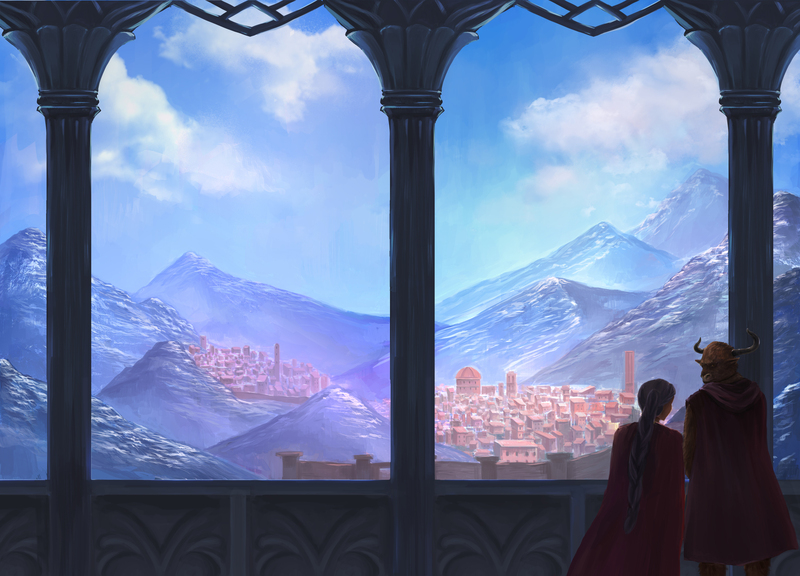 Pancras encounters Qaliah at the Arcane University in Muncifer. She already knows Gisella and is currently working off a debt to the Archmage by acting as a sort of court jester. She goes out of her way to be annoying in this capacity, as one might if they know their punishment is needlessly humiliating. Qaliah ditches the jester outfit and accompanies Gisella and Pancras on their journey once her debt is paid. 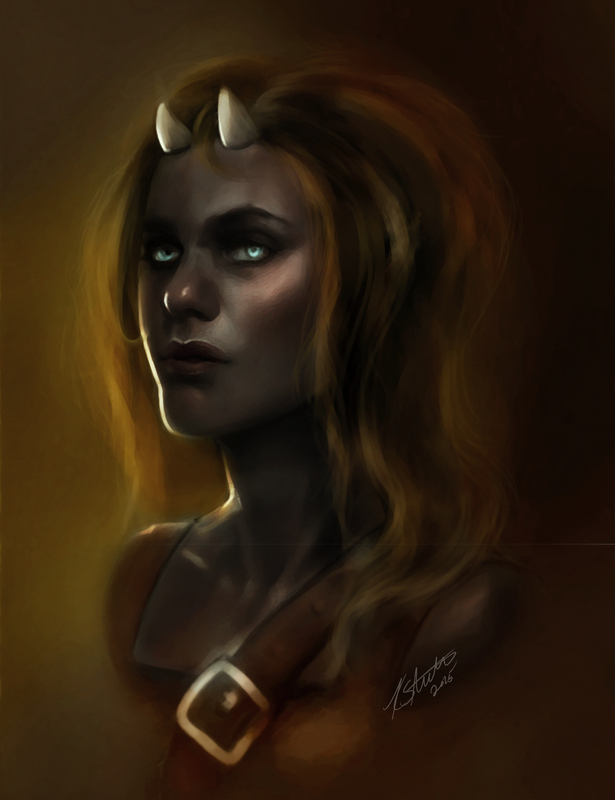 Her fiendish heritage is evident in her jet-black skin, red eyes, and horns, and Qaliah keenly feels the distrustful stares of most people she encounters. She’s used to fending for herself and defends herself with sharp knives and sharp tongue. She’s not sure why she should care about the challenges facing Pancras and Gisella, yet she sees an opportunity to do something worthwhile when she encounters the minotaur necromancer. “Malediction.” Webster’s Third New International Dictionary, Unabridged. 2015.. Web. 14 Jul. 2015. Just in case anyone out there doesn’t know the meaning of the word “Malediction.” It’s the title of my next book for a reason that become evident when one reads it. Little did I know, it would come to define the process as well. I wrote Malediction in July and August of 2014. The first draft sat as holiday preparations consumed our family and the first-round edited didn’t really start until early 2015. By then, I had completed the first draft of the second book in the series, Lament and was working on the third book in the series, Salvation. Shortly after she began work, my first-round editor (my wife) fell ill. Naturally, that delayed things. At this point, I was still hopeful for a Memorial Day release. She fell ill again after we went to a convention in Wisconsin in mid-March, then again immediately after recovering from that illness. I missed Memorial Day, but did eventually get the manuscript in the hands of a paid editor. Unfortunately, a close friend of hers committed suicide about the time I sent her the manuscript. Naturally, that delayed things further. I got the manuscript back once she was finished with it, but of course, I go over it again. Plus, I had Beta Reader feedback to incorporate. Timing would be tight, but I was on track for a Gen Con release. Two months later than I wanted, but still acceptable. Time would be at a premium, as my step-daughter was getting married two-and-a-half weeks prior to Gen Con. My mother-in-law passed away over the fourth of July holiday. Family drama ensued (and still continues to this day). Having a funeral occur the day before a wedding is stressful. While the wedding went off without a hitch, the division of my mother-in-law’s possessions has not been a good experience, despite the fact that my wife desires practically nothing at all (except for one hand-made item she made for her mother that she now wishes to pass to her daughter; not at all an unreasonable request). As a result, my wife is sick with grief, stressed from interactions, and her daughter is moving out of the home this week. The manuscript is still not finished. We’re on a final pass, true, but Gen Con is two weeks away. I still have to do the print layout and since I have a new map, I really want to see a print version of it before I order copies to sell (so I can get the contrast right). If I don’t order copies by Monday (July 20th) or so, I may not have anything new to sell at Gen Con this year. Thus are the perils of publishing. When I titled the first novel of the Scars of the Sundering trilogy “Curse” (then looked for a word that meant the same thing but was more exotic), I had no idea of prophetic it was. Edits are back for book 1 of the Scars of the Sundering trilogy, Malediction! Cover art is finished! The new map is finished! All that remains is incorporating some Beta Reader feedback and doing a final revision pass. 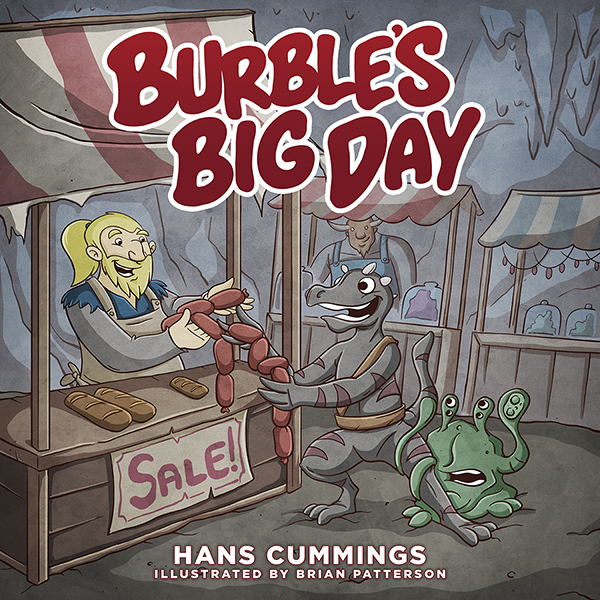 That means that I will have print copies to sell at Gen Con at the end of the month! Official, that’s Thursday, July 30th 2015. In the meantime, here’s the cover art, by Lily Yang. 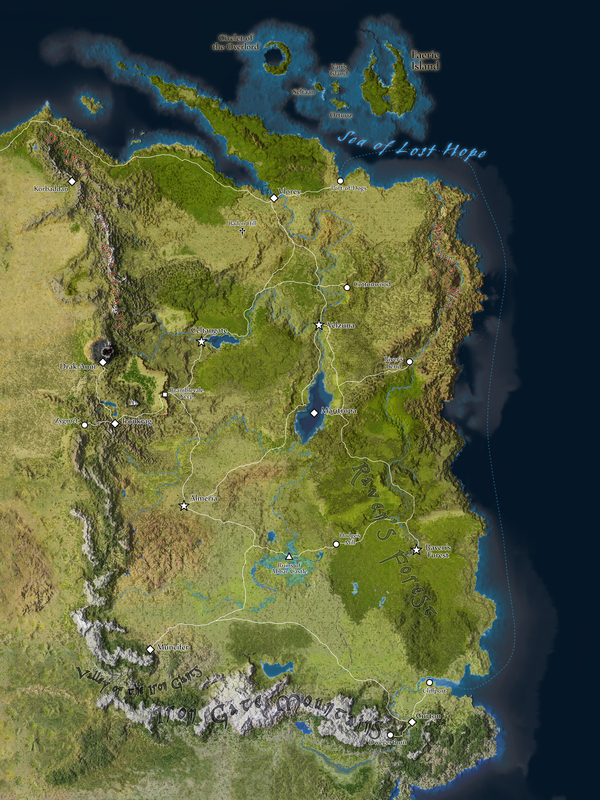 Since the character went to new places and I fleshed the world out more than I had in The Foundation of Drak-Anor series, I decided to have the map updated, as well. Anna B. Meyer did a fantastic job updating the look of the World of Calliome! Finally, we conclude Chapter 1 of Scars of the Sundering, book one: Malediction with our fifth preview. Good thing May has five Fridays! It’s almost as though I planned the whole thing. Pancras realized Kale was in trouble when he caught a glimpse of the little drak dangling by his ankle but knew if he broke his concentration to help his friend, the magic he manipulated to seal the rift would be ruined and he would have to start over. He repeated the words, over and over, pouring every bit of arcane energy he could gather into the rift. “Stenee pyealee, stenee pyealee.” He wasn’t sure the ritual would work. His experience with magical portals was limited to his knowledge of the portal in Drak-Anor. With the help of Delilah, he spent the last several years studying it off and on, and though he never tried to close it, he was confident he knew the theory behind the process, a theory he had, until now, not tested. Kale sailed past him through the air and into the rift. Pancras’s heart skipped a beat, and it took all his effort to concentrate on the task at hand. 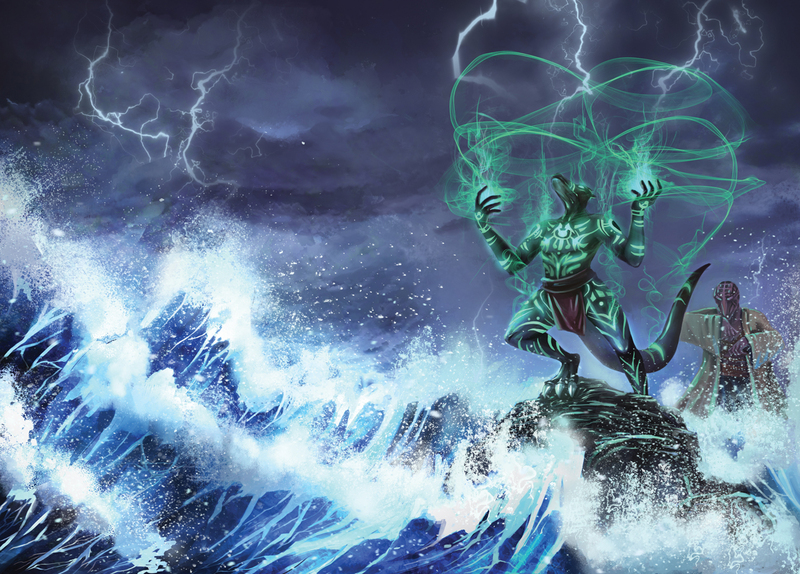 If Kale was inside the rift when he sealed it, he would be trapped in the elemental chaos for eternity. He knew, however, leaving the rift open was far more dangerous to more than just one drak. It pained him to admit it, but closing the rift was worth the life of one drak or even all three of them. The air crackled as lighting arced across the room. The kaleidoscopic colors gave Pancras a headache. He saw no sign of Kale but noticed Edric struggling with a veritable forest of toothed, suckered tentacles. Pancras felt the portal weakening. Its connection with the Mortal Realm was tenuous, at best, and with the magic he weaved around it, that connection weakened further. Splurrrt-woosh! Air rushed past them as the rift contracted, and then a sucking sound, reminiscent of viscous goo squirting from a wine skin, filled the room. Pancras felt something slam into him, driving the breath from his lungs. There was a flash of light, and then all was still. Edric’s sword clanged on the ground as the tentacles he fought vanished. The closing rift bisected the bloodmaw: the part in the rift gone, and the part still in this world mortally wounded. It slithered out of the hole in the ceiling and crashed to the floor with a grotesque, wet plop. As he tried to catch his breath, Pancras fell to his knees. Smokey tendrils wafted from his limbs, growing more and more nebulous until they vanished completely. He no longer saw the shadow demon, but that was no guarantee he eliminated the threat. The dwarf was behind him, getting to his feet. He couldn’t see the drak. “Kale?” Pancras’s voice was hoarse and raspy. Pancras walked around the bloodmaw’s carcass to find Kale curled up against the wall. The drak held his head and moaned. Kneeling down next to him, the minotaur put his hand on Kale’s shoulder. The drak’s scales felt hot, feverish, and uncomfortable to touch. “It’ll pass.” He helped Kale to his feet. I hope. “What now?” Edric poked at the remains of the bloodmaw with his sword. The angular blade sank into the carcass like a knife into a quivering pile of jelly. He grimaced and yanked it out, shaking slime off it. Pancras looked around the room. There was still no sign of the shadow demon. “Let’s try to head back to Ironkrag. You dwarves can probably deal with any remaining beasties down here. I recommend collapsing these caverns entirely.” He figured the dwarves would ignore his advice, but he gave it anyway. “Why is the room all twisty?” Kale held his head and staggered as he walked. Pancras reached under his arm and picked him up and was surprised how light the he was, given his propensity for ale. The three made their way up the twisting tunnel back into the main chamber where Pancras destroyed the ghouls. The cavern was quiet and still, with only the phosphorescent glow of fungus providing light. Nothing stirred, not even cave rats, and by comparison to the cacophony in the cave earlier, to Pancras’s ears their breathing was deafening. Kale’s body cooled, and by the time they returned to the tunnel leading to Ironkrag, he demanded he be allowed to walk on his own. Pancras lowered Kale to the ground before the drak squirmed out of his arms and fell. He kept a close eye on him, though, unsure of whether the effects of the chaos rift were permanent.